I always enjoy writing a story to a brief and ‘The Mystery of the Missing Child’ was no exception. I’d been thinking for a while that I’d like to try my hand at a Sherlock Holmes pastiche. So when Maxim Jakubowski put out a call for stories featuring Holmes’s arch-enemy, Professor Moriarty, ‘the Napoleon of crime,’ I jumped at the opportunity. 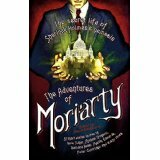 It was perhaps the most fun I’ve ever had writing and I was thrilled when Maxim decided to include my story in The Mammoth Book of the Adventures of Moriarty. The book is out this week: thirty-seven stories by writers including Martin Edwards, Kate Ellis, L. C. Tyler and many others. I’m looking forward to reading them. At £9.99 it is great value and would make the perfect present for lovers of Sherlock Holmes – and isn’t that pretty much everyone?